Since September 2011, Enterprise Music Scotland (EMS) has hosted National Chamber Music Day. This annual event celebrates chamber music in Scotland, raising awareness of the fantastic array of chamber music concerts that are organised annually by our network of over 70 Scottish promoter organisations as well as widening access to chamber music through free performances for members of the public. 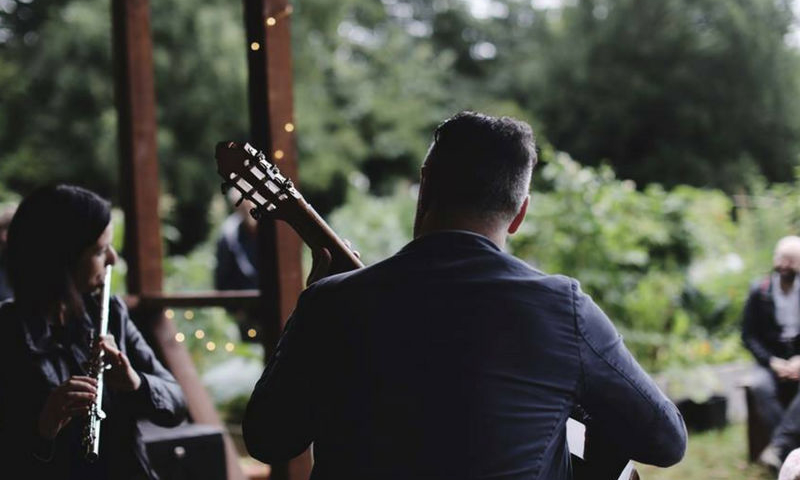 Each year Enterprise Music Scotland work with around 60 professional musicians to plan around 30 impromptu music performances in public spaces across Scotland, spanning from Dumfries to Thurso. Performances are also linked with local promoter organisations to enable them to advertise their upcoming series of concerts to new audiences. National Chamber Music Day performances have taken place in shops, garden centres, galleries, museums, supermarkets, castles, pubs and even at the top of Aonach Mòr. The event has also seen EMS collaborate with partnership organisations such as Maryhill Integration Network, Dance Ihayami, and An Lochran to celebrate the diverse communities in Scotland, Scottish Heritage and to promote chamber music to a wider audience. 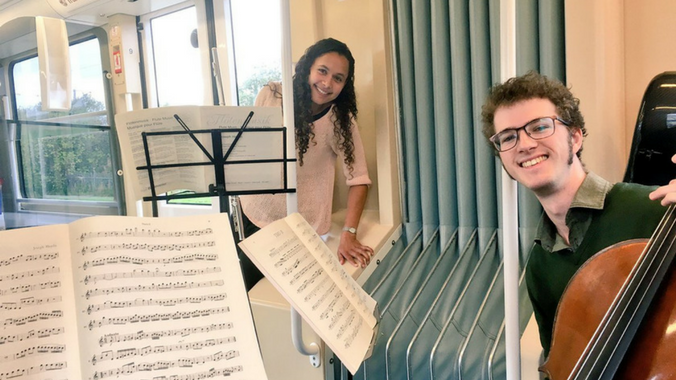 As a Green Arts Initiative member, we have been looking at ways of sparking conversation on environmental sustainability within the chamber music sector. Along with creating a more environmentally friendly office space and monitoring the carbon footprint of our touring network, we have been working with Creative Carbon Scotland to facilitate discussion about the green arts with our partners, stakeholders and audiences. We decided that an effective way of progressing with this work would be to not only embed sustainability within our daily practices but to highlight it during EMS events as a way of reaching a wider audience, starting with National Chamber Music Day 2017. We would work in partnership with like-minded organisations who work in the field of environmental sustainability. We would aim to minimise waste for the event. National Chamber Music Day 2017 took place on the 16th of September. We worked with 34 musicians and 34 partner organisations to put on 27 free chamber music performances across Scotland. Performances took place in green spaces and community gardens across the country including Peebles Community Garden, The Walled Garden in Perth, Ninewells Hospital Garden in Dundee and The Croft which is run by South Seeds in Glasgow. It was lovely to see concerts happening against a back drop of plants and flowers and great to learn of sustainable projects taking place in local towns and cities. We also worked in partnership with several Scottish transport organisations to highlight sustainable travel; The Monzani Trio performed onboard Edinburgh Trams while the McOpera Oboe Duo played on the Borders Railway between Edinburgh and Galashiels as well as for passengers awaiting their buses at Galashiels Transport Interchange. The Vocali3e trio gave a concert at Linlithgow Canal Centre and The Highland Collective played for passengers at Inverurie Train Station. Plans to use sustainable transport provided the opportunity for NCMD to expand into a multiday event. 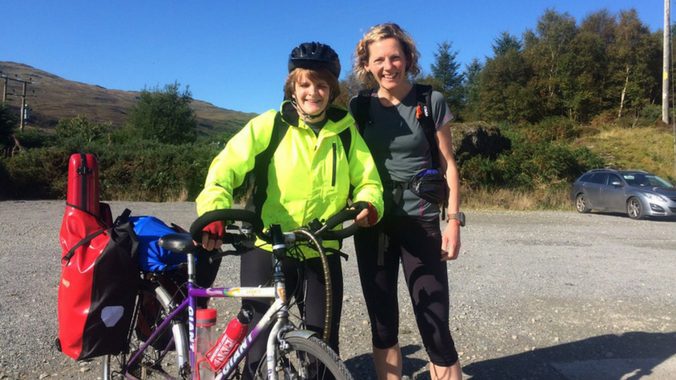 Endurance runner/violinist Elspeth Luke along with cyclist/violinist Emily Carr-Martin undertook a four-day tour of Mull helping to reduce the carbon emissions of NCMD even further by running and cycling to their concert venues in Craignure, Ulva, and Salen. We formed new partnerships with organisations who work to support environmental sustainability. NCMD sponsors, Mackie’s of Scotland, known for their commitment to good environmental stewardship invited the locals to their farm in Aberdeenshire for a Chamber Music and Chocolate event. Audiences sampled the recently launched Mackie’s chocolate range whilst enjoying music performed by the Highland Collective. We also worked with Plantlife Scotland who hosted guided walks culminating with chamber music concerts in Glen Tanar and Barnluasgan. In Glasgow, a partnership was made between EMS, Glasgow Doors Open Days, RSPB Wildfest and The Hidden Gardens to organise daytime performances by the Maxwell Quartet at St Andrews in the Square and Kelvingrove Park Bandstand as well as our NCMD finale which took place at the Hidden Gardens. Audiences were invited to bring a picnic along and participate in various outdoor nature activities led by Wildfest followed by a concert from the Agnew McAllister Duo and The Matilda Brown Ensemble on the lawn. The concert also featured the first ever NCMD commission for which Matilda Brown composed the piece “His Wings” linking to the birdsong that can be heard in the gardens. While we wanted to embrace the green theme, we felt it was also important that the original NCMD mission statement continued to be represented which included performances taking place across the length and breadth of the country. With public transport, this was not always straight forward to organise. However, it did provide the opportunity for creative solutions such as Elspeth and Emily’s tour of Mull which in the end, expanded the event significantly. We had planned for performances to take place outdoors but could not really rely on the good old Scottish weather meaning we had to think ahead and commit a bit more time to creating a backup option for each one. ted posters altogether, we reduced the size of them from A3 to A4 and ensured that they were produced by a green printing company. With ensembles visiting two venues in one day, the logistics of planning travel using only public transport proved challenging. In some cases, it was not possible due to lack of access at rural venues, heavy instruments, health issues and infrequent timetables. Where public transport was not possible, we encouraged carsharing. Despite a few challenges, we do feel that the benefits greatly outweighed the negatives. The Green theme provided a strong stimulus during the creative process, influencing our planning process and resulting in the addition of new elements. Collaborating with new partners who are not directly connected to the chamber music sector was a great asset in helping to advertise National Chamber Music Day to a wider audience. Working with local as well as National partner organisations was very effective. The performance venues all worked hard to spread the word about their NCMD concert in their local communities and it was great to see extras such as BBQ’s and picnics being added to performances. The green theme also meant that we worked with venues which we may not have previously considered. One great outcome of this being new partnerships between chamber music promoter organisations and local venues/community groups. For example, one community garden and promoter organisation had no idea that the other existed before their NCMD event but are now making plans to work together this year. 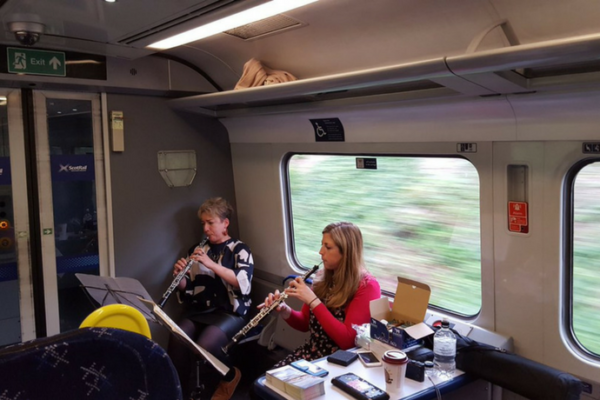 Asking ensembles to travel via public transport proved to be an interesting exercise in looking at the challenges facing musicians who wish to become more environmentally responsible. We also found that small changes we did make resulted in a 15% reduction in reduction in travel emissions for National Chamber Music Day. We learnt a lot from the process and plan to keep applying principles of sustainability that were learnt through this National Chamber Music Day to future Days and other events no matter the event’s focus. The topic of environmental sustainability can seem quite vast. We found that by choosing a few specific areas, we were able to devise more effective and attainable outcomes. Make use of partnerships. Working with other organisations be it big or small, was greatly beneficial to us. Not only did it help us to promote our event and reach new audiences, it also gave us insight to the different kinds of environmental work happening across Scotland and has provided opportunities to link this to chamber music through future collaboration. Embrace the unexpected challenges. We found that a lot of the hurdles we crossed, such as organising musician travel, raised interesting points which we were able to take forward after NCMD. Main photograph copyright Louise Mather. Other photographs copyright Enterprise Music Scotland.